This dip does double duty as a sauce and goes great with sticky rice. Red Curry paste can pack a punch, but I like the contrast between the salty crunchy lotus chips and this rich, spicy Thai staple. Roast 1/2 cup of organic peanuts in a 350 degree oven until nicely a few shades darker and slightly fragrant, about 10 minutes. Let the roasted peanuts cool a bit then process until as close to paste-like as you can get them in a food processor. In a medium sauce pan or medium heat add 1 tablespoon unflavored oil (anything but Olive oil works), when the oil is hot but not smoking add 1-2 teaspoons of red curry paste (depends on how hot you like it) whisk for about a minute then add 1 cup of coconut milk, 1-2 teaspoons palm sugar (brown sugar or white sugar works fine) and the peanuts. Whisking constantly bring the mixture to a boil. It will thicken nicely, once at the boil remove from the heat and whisk in a pinch of salt, 2 teaspoons dark soy sauce* and and 1 Tablespoon fresh lime juice. Taste and adjust seasoning to your liking. Serve slightly warmed or at room temperature. *dark soy sauce can be found in any Asian grocery store and gives this deep a richer flavor and a beautiful deep brown color. In a pinch use what ever soy sauce you have on hand. One of the things I most like about Lotus Root chips is how easy they are, and cheap Lotus Root is usually about $1.60 give or take a pound. It’s readily available in any Chinatown or Chinese Grocery store and best of all it’s easy to make! 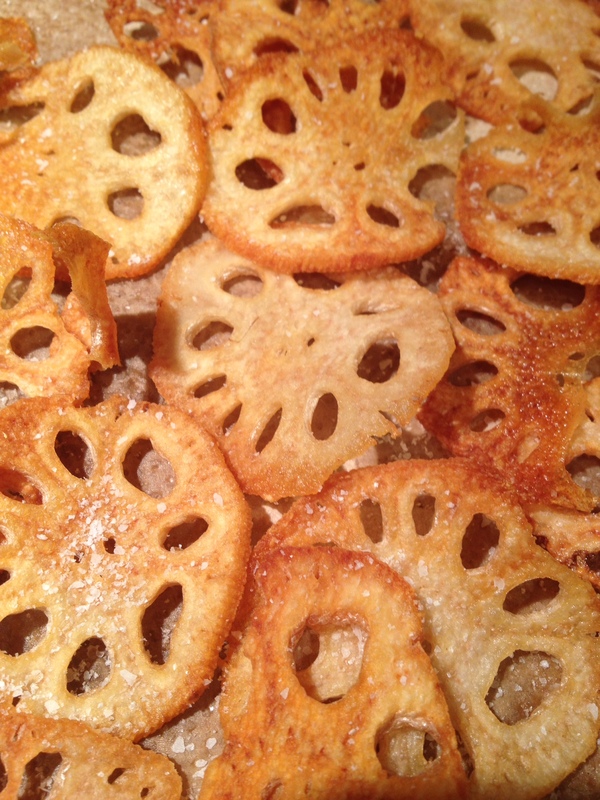 While you are waiting for the oil to get hot, use a vegetable peeler and peel a portion of your lotus root (as much or as little as you think you need, 1 lb is a good place to start…as there really is no such thing as too many chips!) using a Mandolin, slice them into 1/8′-1/4″ discs. Place the lotus discs on a paper towel and pat them down so they are as dry as possible before frying. I like them a little on the thicker side, but you can slice them as thin as you want – the thicker ones take longer to cook, about 6 minutes. When the oil has reached the correct temperature place the cut lotus chips into the oil trying carefully to not crowd them – they should be one single layer, fry in batches. When the chips have browned completely, use a slotted spoon to remove from the oil and onto some paper towel, blot off excess oil and toss with salt (you can add 5 spice powder to your salt if you like – about 1/4 Teaspoon 5 Spice to each teaspoon of Salt). Great plain or as a garnish with a curry or best of all with some spicy Red Curry Peanut Dip. 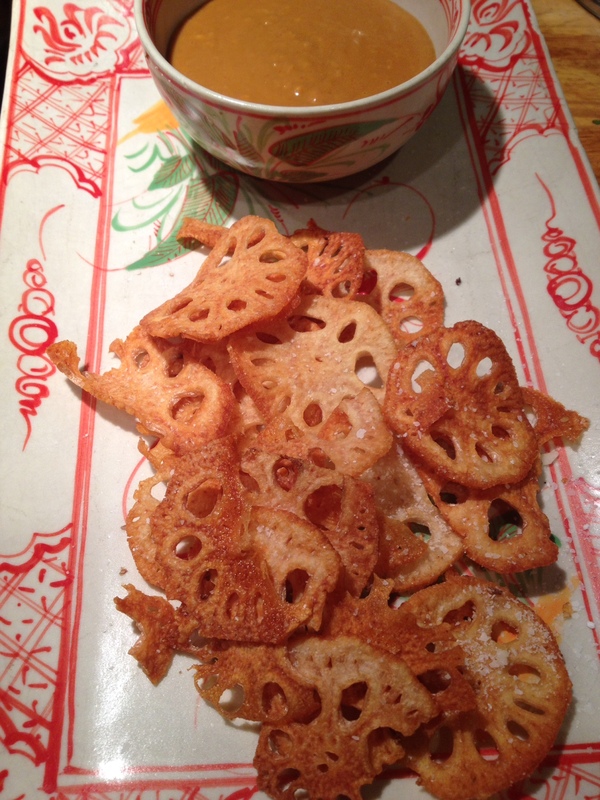 This entry was posted in Recipes and tagged Asian Food, Chips and Dip, Holiday Entertaining, Lotus Chips, Red Curry Peanut Sauce. Bookmark the permalink.